In’Tech specializes in manufacturing plastic parts and offers engineering, tooling, injection molding and additive manufacturing services. 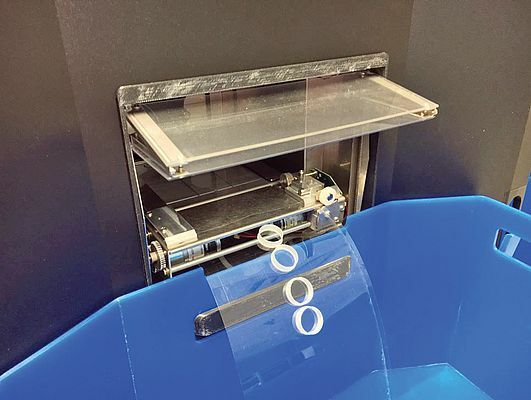 According to Jason Lilla, In’Tech regional account manager, there’s a growing number of manufacturers that need additive manufacturing capabilities for rapid prototyping, or a bridge to production before final injection molding is complete. “We’re interested in a share of that market and hopefully we can help people get their parts quicker for testing fit, form and function,” said Lilla. The hurdle, however, is getting beyond the one-build-per-printer paradigm. Individual 3D printers have a limited production capacity per build, and require human intervention to remove the parts and initiate a new job. To serve more customers with expanding production needs, that formula has to be scaled up dramatically. To meet these growing market demands, In’Tech adopted a new additive manufacturing model: the Stratasys Continuous Build™ 3D Demonstrator. This 3D printing innovation sets a new standard with automated, continuous production. Typical 3D printers can be compared to series production, with a single printer producing one build at a time in succession. But the Demonstrator turns 3D printing into a parallel process, with multiple print engines building simultaneously. The Stratasys Continuous Build 3D Demonstrator consists of modular racks of three print engines, which can be scaled up to increase production capacity. In’Tech currently uses a 9-unit system, but sees the possibility of adding more. “We can run all nine print engines on one part to speed throughput or we can run them individually. It gives us greater flexibility to meet the customer’s needs,” said Neilson. Increasing capacity to serve more customers simply requires adding more printer racks. Neilson says that can happen within a week, rather than the three to four months it would take with other types of equipment. “If we can continue to add print engines that quickly, we’ll have no problem keeping up with customer demand, no matter how big our customer base gets,” he adds. Increased throughput is one benefit, but the real beauty of the Continuous Build Demonstrator is a new level of 3D printing automation. It prints the parts, ejects them and starts a new build without human intervention. Multiple jobs can be printed and print queues are automatically apportioned, based on printer availability, maintaining an efficient build schedule. If a print engine experiences a problem, the downstream jobs are automatically distributed to another available printer. “We like that it’s plug-and-play, so if there are any issues with a print engine, it can be easily replaced with another unit and be back up and running very quickly,” said Neilson. In’Tech sees this innovation as a boon for their ability to meet increasing production demands. It gives In’Tech’s customers what they need, when they need it, through an automated, continuous-production process. That means making parts in sufficient quantities so injection molding customers don’t incur the expense of hard tooling for limited production runs. This lets customers analyze and make adjustments as needed, avoiding the cost to modify tooling. Instead, they can quickly adjust designs and get the parts they need, typically same day or the next. Mark Neilson adds that for some applications, the quality of the Demonstrator parts are nearinjection molding quality. Even in the initial stages, this new 3D printing paradigm has already shown its promise for In’Tech Industries. “We’re excited to get this going and start to see it run full-form and we’re excited to expand it,” said Neilson.